Demonman and Telex are on a double date. Everything was going well until a ninja appeared out of nowhere and tried to steal Demonman’s date’s purse. Issue #2 ended with Demonman, Telex and their dates surrounded by ninjas. 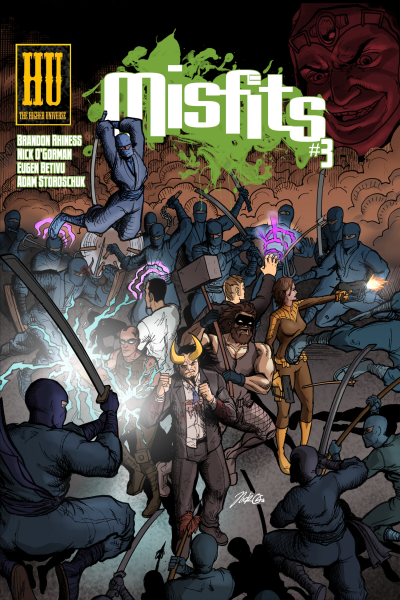 Misfits #3 sees the Misfits square off against The Ninja Master, the lamest villain in recent history. The only problem is that the Misfits must first deal with Ninja Master’s horde of hundreds of ninjas. This issue is action-packed and extremely violent. Not for the faint-of-heart. 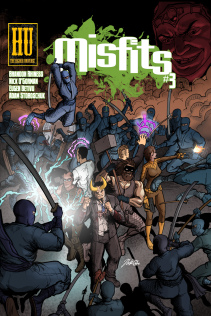 Read reviews of Misfits #3 or submit your own to fanreviews@thehigheruniverse.com.